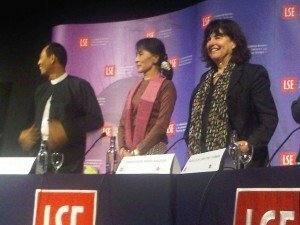 Although this is, at heart, an Indocentric blog (she says, writing from the Kruger Park…) this guest post concerns our neighbour, Burma. The post belongs entirely to my daughter Anjulie, who is my guest blogger today. Today was a good day. I overslept but wasn’t late. I made some progress on my dissertation and my job search. 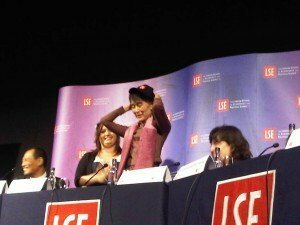 And I sat in the front row and watched Daw Aung San Suu Kyi speak at the LSE in her first public speaking in England since she left in 1988. And the organisers had also dug up a photograph of her father from when he visited England in 1947 (I think), because today is a particularly special day for Daw Suu—it is her birthday. So of course, we all stood and sang happy birthday to her. I can confidently say that singing happy birthday to Daw Aung San Suu Kyi with about 500 other people made me tear up, gave me goosebumps and was one of the most memorable and special experiences I’ve had. I got goosebumps reading this. Jealous to the core. How wonderful to read this. Brought a tears to my eyes. I wish my grandfather were still alive to see this. He knew her father in the Burma days, and he knew her when she was a young girl. By the way, Christine, why not meet in our common neighbouring country ? Thank you for your description of the wonderful DAw Aung San Suu Kyi’s visit to LSE. You are a lucky girl to have been there when she came. There are very few people who are so inspiring, and she is way up there, on the pinnacle. We have just finished listening to her speech to the British Parliament…..
ooooh, Corinne Block Raguin – tempting…should we ?!! Why not ! Let’s coordinate your busy agenda with our laid back schedule. I’d love for an opportunity to write a guest post for your blog. I’m a travel writer, and currently write for the blog http://onetravelbloggers.com/. What types of posts are you looking for? Can I send you over a post that I think may fit well with your audience? Hope to hear from you soon, and please check out my blog posts to sample my writing style.